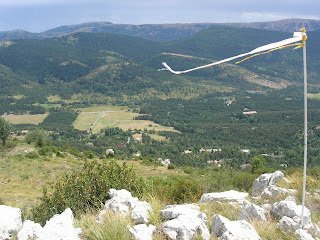 This morning notorious optimistic pilots executed the plan that was designed last night at the Gréolières patron party: head out in the morning and try to fly Gourdon. So I collected Åke from Sweden, Simone from Gréolières, and John and Kerstin from England into the minibus and then we drove through Cipières to the Gourdon launch. Alas, our optimism did not suffice to counter the cold fact that the wind was already from the north-west, over the back. In addition huge clouds were building quickly and the front that was predicted to sweep by seemed quite a bit ahead of schedule. So back we went. Simone, John and Kerstin would pack and then leave for nearby St. André where the last round of the British Open 2008 will commence on Sunday. I myself used the afternoon to check out a couple of the other sites in the neighborhood, Col du Bleine (picture above) and Lachens. Once I was at the top of the 1700m Col de Lachens, the post-frontal mistral was blowing with full force, it was actually difficult to stay put! The mistral did nicely clear out the sky so in the late afternoon it was all sunny, and hence nicely warm. 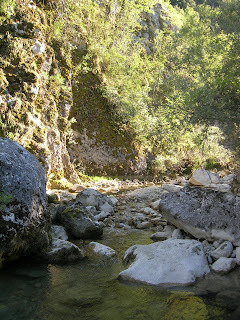 So on the way back home I drove via Andon through the Loup valley and stopped near a trail that led to a very nice bathing place (picture below). All in all not a bad day at all, and there still is the village party to come! The forecasts for the next days look very promising so we should have some good flying ahead of us.